First of all: Happy International Women's Day everybody! The online sewing community rock, and is an excellent output for preserving and at the same time developing activities that traditionally are tied to women. We are keeping female history alive by engaging in sewing, knitting, embroidering and crocheting. Keep up the good work everyone! With that said, here is my most recent effort in keeping the proud tradition of home sewing alive. Sometimes I feel like I'm stuck in my own style rut, and it seems like I can't get myslef out of it. After years of sewing for myself, I've learned what styles suits me well, and I know what to steer clear of. But sometimes I would like to shake tings up a bit, hence my new reccuring theme “Exploring New Territories”. 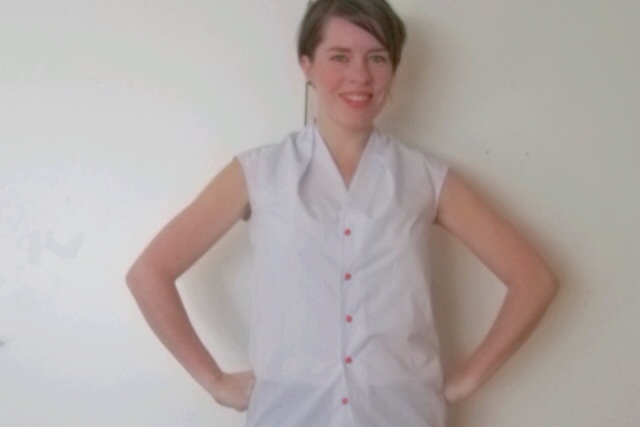 First up is the boxy blouse shape. For the last couple of years, I have made lots and lots of skirts and tops and dresses, which all of them accentuate my waistline. I know that it is a style choice that flatters my figure, and I am very comfortable in that particular style, but at times it would be nice to edge it up a bit. In my opinion an emphasis on the hourglass shape is a strong marker for femininity, and that's not always the way I want to present myself. I'd like to test out other shapes as well. This particular blouse is BurdaStyle 09-2011-128. You might have seen some pretty versions of it out there, it has become quite the popular one. I chose to make mine in a pinstriped shirting bought years ago on sale. I cut it last summer, but let it rest as winter approached. The other night I pulled the pieces out and stitched it up. 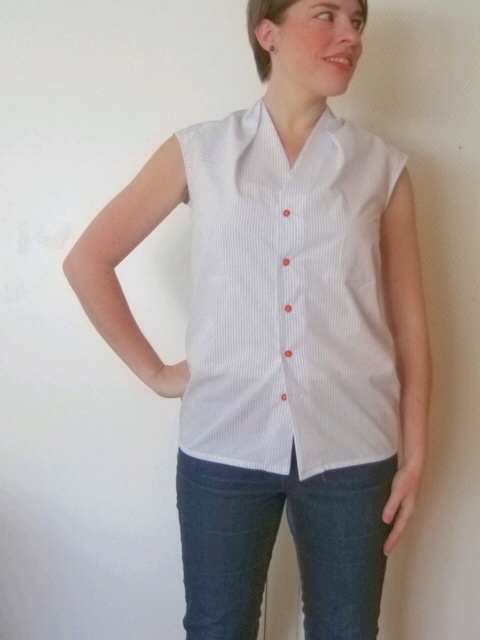 Quite an easy make, and a style I rarely make, with the pleated neckline and all. Normally I would tuck this kind of top into something high-waisted, but as I am trying to explore new territories here, I am wearing it untucked! What do you think about style choices? Do you stick to your guns no matter what, or do you like to explore different shapes and styles? The blouse looks great! I think it’s always a good idea to try new things, at least once, because you never know what you might discover – a new favorite maybe! I really like your version of this blouse! It looks great. I’ve been really into un-fitted waists recently but am starting to feel interested in more blouson and fitted shapes. I’m like you–I like to emphasis the waist. It took me a while to realize that was the silhouette that I’m most attracted to, and the one that is most flattering on me. Now that I know, I’m reluctant to branch out from that, for fear of wasting my time making an unflattering garment! Wow, you look great!! I really like that style on you, esp. paired w/ the jeans. Love it. I’ve always really liked that pattern. I like the fact that you could wear this one either way; un-tucked and boxy or tucked in. It’s a really pretty shirt. I really like this on you! I’ve eyed this patter too – I really love the tucks at the shoulders. You chose great buttons – very cute and fun, which makes the whole outfit work!